Disclosures: I have a paid bulk account with Flywheel. I’m not being paid for this review, but I am an affiliate and an Agency Partner with them which means they host this site for free. They also sponsored my travel to Wordcamp Orange County in 2016. TL:DR: Since moving most of the sites I manage to Flywheel, I spend less time fighting with servers and more time making my client’s sites better. Stop fighting with servers and move your website(s) to @HeyFlywheel. When it comes to web hosting, you could say I’ve been around. In the last two years, I’ve tried a lot of different hosts, including WP Engine, Digital Ocean, Site5 and Siteground. A non-trivial pursuit considering what a pain it is to move a website, especially if there’s an SSL certificate involved. As the months progressed, I kept coming back to Flywheel as the easiest, most cost-effective and pleasure to use solution. They allow me to spend a lot less time fighting with servers and more time making my client’s sites the best they can be. Flywheel caters to designers and developers creating sites for clients. They’ve created a lot of features to take the pain out of the process, and continue to add more. For as long as I’ve been in business, I have always advised my clients and anyone else to never let your developer host your website. I’ve experienced and heard too many horror stories about clients locked out of their websites or not being able to reach their developer to resolve a critical issue. In my opinion, your web host should be large enough that if someone calls in sick, you never know about it. And of course, I have been beating my drum about the importance of business owners owning their web assets for a long time now. Eventually, the ease of dealing with Flywheel compared to the other hosts I was using was so glaring that I reversed my stance on ‘hosting’ clients and signed up for a bulk plan. When a client signs up for Flywheel hosting through my bulk plan, they still own their account. One of the first things I do is create a free login for them and send them the information via 1Password. They can login to their account and do anything I’m able to do. If we decide to part ways, they can call up Flywheel and request that their site be moved to an individual account in their name and take over the billing. Everyone can pick up their toys and go home at any time. I only offer hosting through my bulk plan to clients who are signed up for a client care plan. My goal isn’t to make a profit on hosting, but to make managing multiple sites easier. I sweeten the deal by offering $5 / month off the Tiny level plan. However, I'm perfectly happy to manage sites as a collaborator as well, for folks who prefer to maintain their own account. The Flywheel dashboard is clean, uncluttered and gets out of your way. 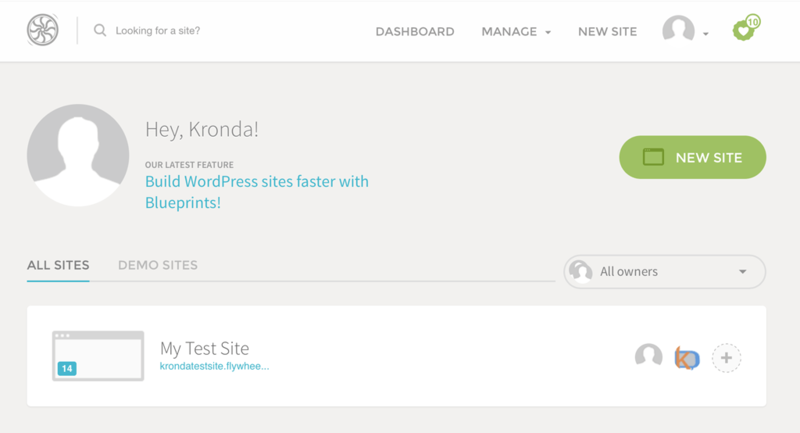 The user interface for Flywheel is gorgeous and easier to use than every other web host I’ve ever used. The layout is clean, uncluttered and gets out of your way. You can even click the thumbnail and they will automatically capture a little screenshot thumbnail of your site! If you’re a highly visual person managing a lot of sites, it’s a nice touch. Easy billing transfer to clients. This is probably the #1 feature that initially sold me on Flywheel. No more waiting for non-technical clients to figure out setting up their hosting account. Creating a new WordPress site couldn't get any easier. When you’re ready, you can seamlessly transfer billing to your client. I’m a big fan of version control and in the past, I used an elaborate custom setup that allowed me to easily track and deploy new code and somewhat easily update the database. 1-Click staging sites have replaced this function by allowing me to easily copy changes from the production site to the staging copy, or update the production site after making site changes in the staging version. If you really need to deploy with Git in your workflow, it can be done via a third-party tool Deploy HQ. So far, I haven’t found it necessary for the kinds of projects I take on. A single login which is the same as my Flywheel login credentials gives me access to the files for every site I own or have been given access to as a collaborator. If you need to give access to someone else on your team, have them create a free login and then add their username as a collaborator for specific sites. No need to share your login and give access to more sites than needed. Adding a collaborator to your project takes seconds and doesn't require sharing your login information. If you have a larger team you can create an organization to give everyone on your team access to all your sites. They will be able to create new sites, push changes to production, or request billing from a client. Sometimes I think Flywheel has spies in my house. I was recently pondering how to address the problem of spinning up sites quickly but with all my commonly used plugins, themes and customizations. That same month, Flywheel released their Blueprints feature, which does exactly that. Create base installs for whatever kinds of sites you most commonly build: blogs, e-commerce, learning management systems–and then create new instances of those sites in minutes. This feature will literally save me hundreds of hours per year. 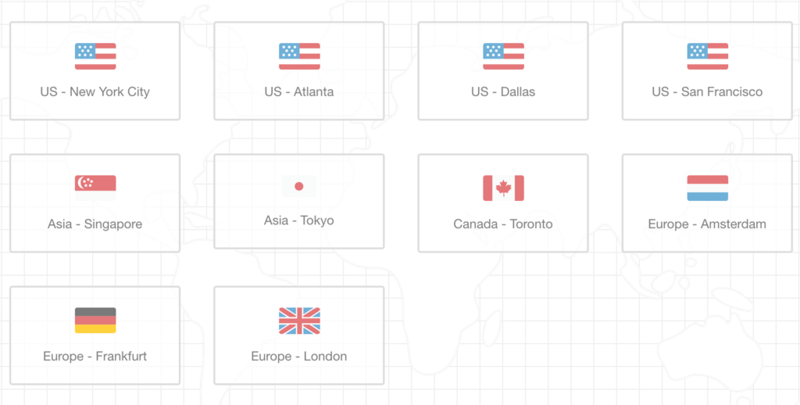 If your clients are all over the world, Flywheel has 10 data centers around the world so you can choose the one closest to you or your client. 10 data centers around the world for your convenience. This program is still fairly new, but I didn’t hesitate to join. In addition to having your site hosted for free, you get first access to the new features, like Blueprints. As an Agency Partner, you have access to a dedicated account manager to help support client, solve any issues or help with upgrades. You can literally create a Flywheel account in under a minute. It's easier than creating a Facebook account. Even the most experienced pros find it tedious and cumbersome to move a website to a different server. For a business owner with no technical background, the task can be overwhelming. If you can find the basic credentials for your website such as the old web host login, WordPress dashboard login and FTP access, then Flywheel will do the rest. If you’re someone who doesn’t feel comfortable or doesn’t want to manage the day-to-day care and feeding of your website, you MUST have managed hosting. Managed hosts take care of keeping your site secure, backed up, and keeping at least your core WordPress files up to date. This saves you from logging in one day and finding a hacked site that you have no idea how to fix. The biggest player in managed hosting is WP Engine starting at $29 / month, but you can get the same features from Flywheel starting at $15 / month. For non-technical consumers, figuring out which tech companies to trust with your website can be overwhelming. Flywheel was recently added to the list of companies recommended by Automattic, the company that makes WordPress. That’s a pretty good endorsement. The Nitty Gritty: What About Customer Service? Before switching, I called a sales agent at Flywheel who transferred me to a technical support person. We talked through the issues I was having on WPE and they were able to detail how they would handle the site, what kind of upgraded plan would suit my needs and what steps they could take to ensure things worked properly. After the transfer, I worked with one agent for most of a day trouble shooting issues. Flywheel doesn’t have the speed of customer service of some other companies such as Siteground. They don’t have 24/7 immediate chat support like Site5 or Siteground. But when I’ve needed to contact them, the responses have been reasonably swift, and more importantly, they tend to solve my problem the first time, and include a thorough explanation of how it was fixed. They have also found issues on their own, fixed them, and then let me know about it. I like the proactive approach. I could reach a Siteground support representative in 30 seconds, but I also was constantly having to call them and it almost always took several tries to get my problem solved. Their 1-click staging sites never worked reliably. I would rather have good customer service that I don't need very often. Flywheel does have 24 hour email support, and you can contact them via the emergency support email after hours. The responses are generally within an hour or two. They’re also in the process of hiring more support people, so I’m hopeful that they might have instant 24/7 support at some point in the future. You like to tinker with your server, need fine-grained control and advanced settings. You love PHPMyAdmin. You can still access and manipulate the database, but the interface is custom. You need instant responses from support. You’re concerned about price above all else. 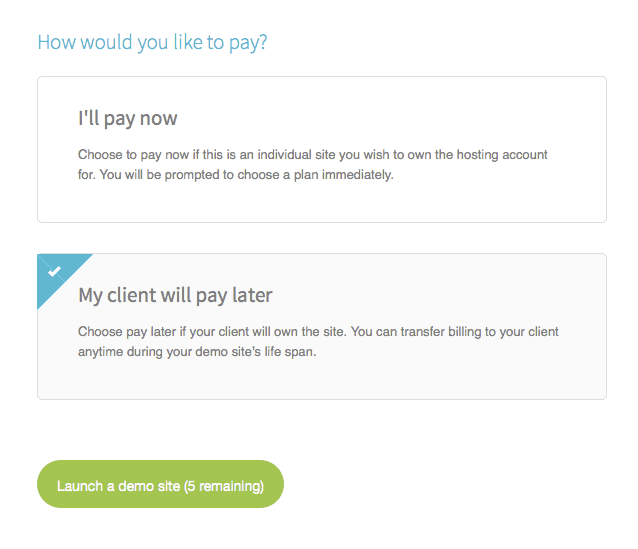 You manage a bunch of sites and want easy client access and billing. You want things to just work and don’t want to spend your time managing servers. You value security, speed and ease of use. You’re a consumer who wants to know their site will be safe and regularly backed up, and easily restored if something goes wrong. If what you’ve read sounds like something that will make your life easier, sign up here. Thanks for the kind words Kronda! We’re lucky to have customers like you. Don’t ever hesitate to reach out and let us know what we can do better! Hey Robert, I’m so glad this was helpful for you. Good luck! I am a simple blogger who has had problems with my WP sites being hacked etc. I first went to WP Engine and then even moved over to Squarespace. After not feeling the love with SS, I wanted to come back to WP but knew I wanted to be hosted again. Did my homework and decided on Flywheel. They are simply the best; I have been so impressed by them. Setting up was not a problem at all, and when I changed my domain name.. Dang done in a few mins (after a bit of tweaking at the domain end). They may not have the 24/7, but any issues seem to be answered quickly. I love the free tools etc that they provide.. I don’t manage email for clients. I use Google Suite for email and Hover for managing domains and recommend clients do the same. If they can’t set it up on their own, they pay us to help with setup as part of their project, but I don’t offer email tech support beyond that. HI Kronda, I’m a WP Elevation member myself : ) I’m currently hosting my clients ecommerce sites on WP Engine, however I’m thinking about switching over to Flywheel. Is Flywheels hosting just as good for ecommerce websites? Thanks! Hey David. I haven’t had any problems and I’ve spoken to their support team and they have some pretty beefy e-commerce sites running on their servers. I’m happy to make an intro to a Flywheel rep if you want to talk to them about it!